Product prices and availability are accurate as of 2019-04-13 11:50:51 UTC and are subject to change. Any price and availability information displayed on http://www.amazon.com/ at the time of purchase will apply to the purchase of this product. Grab & Go is the latest innovation from the multi-award winning Walkodile brand of children's walking products. 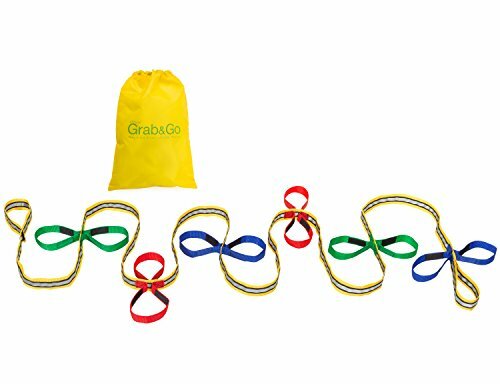 Grab & Go can be used as a walking rope for simple, short walks with children and/or as an Emergency Evacuation resource for school, nursery or playgroup It is available in either a 6 child or 10 child option, & one or more Grab & Go's can be linked to each other. As a Walking Rope, Grab & Go is an inexpensive, teacher approved, walking resource. Adult supervisors can simply ask the children to hold onto the brightly coloured handles or, for enhanced safety, each child can be linked to the product via a fastening on the handle. As an Evacuation Resource - in an emergency situation it is essential that children and adults are able to stay together and move quickly to a safe area. While an evacuation may move easily and quickly during practice drills, evacuation of young children in an actual emergency situation may be much more challenging. For example, most teachers and other adults have not experienced a true fire emergency, and may be unaware of the visual and physical effects of dense smoke and heat. Grab & Go facilitates the children's movement as a group, even in frightening situations with low visibility. The spacing of the loops enables children to "get low and go" (e.g., crawl) while still maintaining physical contact with each other and with the responsible adult. In addition to promoting child safety, Grab & Go is designed to encourage children's decision making and self-help skills. Through evacuation practice drills and other learning activities, children learn to stay together and follow the adult to safety. They develop self-help skills as they insert their hands in loops and fasten the Velcro to tighten it. The brightly colored loops also promote color recognition.